I have been enjoying a very informative and illuminating tour of the Life of Phil, which has seen us exploring his old stomping grounds in Sheffield and Doncaster, renewing friendships with old mates and taking rambles down Memory Lane. I have observed a certain theme emerging from Phil's memories; see if you can spot it: "Oh, there used to be a great cake shop here" ... "I remember this street, there was a great chippy" ... "there were two chippies opposite each other on this street" ... "this cafe used to do great coffee, lets try it out". Thankfully, we've balanced out all this gastronomic remembering with a bit of walking. 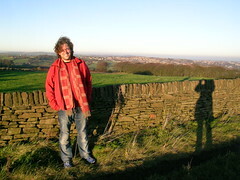 This photo was taken looking out over Sheffield from the Round Walk, which travels out into the woods and towards the moors. We were blessed with a gorgeous sunny day, although the mercury barely crawled above zero, and we had to watch our step on the pavements which were slick with ice. And a big hello to all the lovely friends (and family) who have taken us in, fed us and made us feel so welcome on our UK excursions so far: Sara, Pat and Bob, Pat and Vics, Roger and Sarah, Dave and Debbie, Flea and Dave, Pam and Keith, and Sam and Ants.